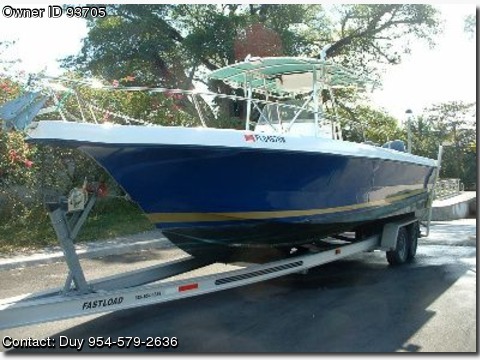 1994 Twin 250 VX Yamaha,1 Engine had overhaul and both engines have Recently Services over $ 6,000.00, 2 new impellers, have new trim motor on starboard,2 low units have new water pumps and seals, 3 new marine batteries and cables and new switches. Swim platform on motor bracket with ladder and stainless steel Props, Hardtop with outriggers, live well, wash down system, fresh water, full cushions package, Bow pulpit, Bow camper, overhead electronic box, storage tackle center, new Sony cd & radio, mp3 ax, new Eclipse fixed VHF, GPS Map 500 series, hydraulic steering, trim tabs, trailer have new brakes and led lights, The boat just have finished $13,000.00 new full paint job with full primer, top side painted with snow awl craft 2000, the Hull paint with Royal blue with 2 clear coats Awl Craft 2000, painted new nonskid all decks, 2 engines fresh painted, new nonskid on swim platform, Clean title in hand. Reason for sale have 2 boats one must go.